Featuring "universally beloved" terror Desmond Fishmen, the magic of London at Christmastime, off-beat music festivals, and an extra-special what-if story in which Susan, Esther, and Daisy never became friends! 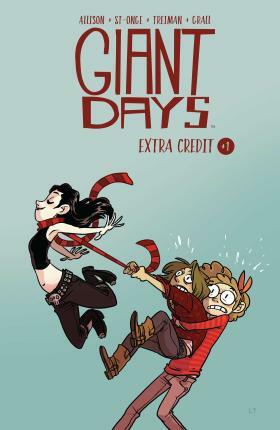 John Allison (Bad Machinery, Scary Go Round) and illustrators Jenn St-Onge, Lissa Treiman, and Caanan Grall take us to Sheffield University for bonus coursework and new stories from the Giant Days Holiday Specials, and BOOM! Box Mix Tapes.